Are you old enough to remember when digital was called Information Technology or IT? Are you, like me, older still and remember when IT was called data processing? If so you will know the maxim that still holds good today that it is only when data is processed does it become genuine meaningful information. Housing fake news is mostly fake analysis or for want of a more tactful phrase piss poor analysis and nowhere more so than in the lazy analysis the usual suspects of the London-centric commentariat give to rented housing in the UK. A classic example is the article I read today entitled “100 tenants a day lose homes as rising rents and benefit freeze hits.” It comes from the Guardian and uses other usual suspects of the Cambridge Centre for Housing Research (CCHR), Shelter and the Joseph Rowntree Foundation (JRF) – the proverbial commentariat – and as its title suggests and its article reads the rising evictions are all the fault of the nasty private landlord being allowed to use no-fault evictions. This is a classic case of PPA – piss poor analysis – which as I go on to explain is much more dangerous than just criticism of its laziness. 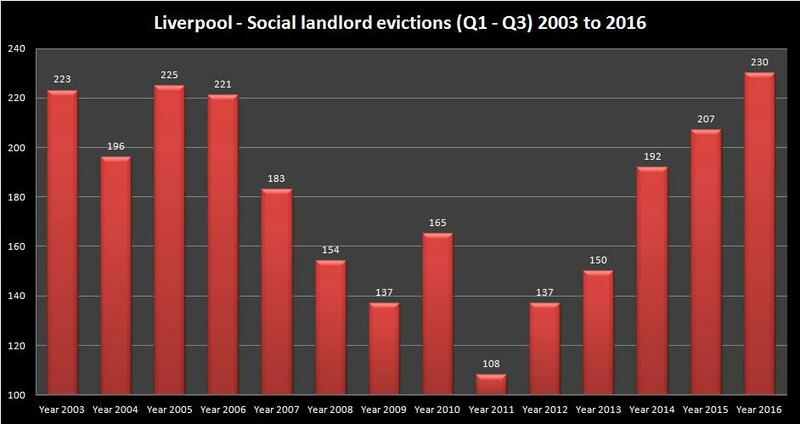 To explain the article quotes eviction numbers for the calendar year of 2015 (see end) and this data reveals a total of 41,169 evictions of which 22,150 or 54% were from private rented properties and 19,019 and 46% were from social rented properties. In the UK we have a total rented housing market which is 53% private rented and 47% socially rented and so this eviction data very closely reflects the proportion of renting landlords in the UK. The correct way to look at this data is the eviction proportions are precisely what you would expect if both private and social landlords had to go through the same process to evict tenants. Yet we know that private landlords have a much easier and quicker legal framework to evict hence the real question is Why are social landlord evictions so high? You would logically expect given the private landlord can evict at the drop of a hat that evictions from the private rented sector would be far higher than this data reveals. Yet it isn’t but that does not stop the usual suspect commentariat saying the eviction and homeless increase is all the private landlords fault and how the private sector version of housing benefit (LHA) needs to be unfrozen to somehow correct a position that mirrors what you would expect if LHA was not frozen and no-fault eviction were outlawed! What this data shows is that there is NO correlation between higher evictions and private landlords able to use no-fault evictions. The actual figure the data and fact once processed reveals this. It may sound or read as wrong yet there is no evidence to support the contention that the no-fault eviction tenure used by private landlords leads to higher eviction figures there! It must also be stated that social landlords increasingly use the no-fault tenure of Assured Shorthold Tenancy (AST) in increasing number in (a) social housing under the guise of Starter Tenancies or Introductory Tenancies or similar; and (b) in the private rented properties that housing associations own and operate as private landlords. In both these cases social landlords also operate no-fault evictions like the private landlord yet the usual suspects fail to mention this and fail to consider it as a reason why social landlord evictions are so disproportionately high. IF by some miracle that no-fault evictions are outlawed we would logically find that evictions by social landlords are much higher than evictions by private landlords as this move could prevent up to 100% of current private sector evictions yet only say 5% of social tenant evictions or perhaps 10% as the use of AST in the social rented sector can be no more than 10% despite its escalating use in starter and introductory tenancies. Outlawing AST and its inherent no-fault evictions is to be welcomed and greater security of tenure for all tenants should actively be sought. YET the perverse analysis of the great and the good usual suspect commentariat is only blaming the private landlord in a chronic case of piss poor analysis. It is almost as if Shelter are doing the private landlords bidding and seeking only to unfreeze the LHA cap to abate the eviction figures from the private rented sector. Yet if as I say by some miracle we see AST and no-fault evictions made unlawful we would be left with the real UK housing eviction problem starkly identified which is the high level of evictions by social landlords! This Guardian article of chronic fake analysis is regrettably all too common and has been ongoing for decades and at its core is what I call the London, London, Bloody London school of fake housing analysis. In short the usual suspects project London’s perverse and wholly atypical housing problems and seek national housing and housing benefit solutions to be applied to 100% of the UK in response to the perverse London housing problems which account for just 13% of UK tenants. Then we all wonder why successive UK housing and UK housing benefit policy changes from the Tories, from Labour and coalition governments repeatedly and consistently fail! This perverse London, London, Bloody London focus of the UK housing commentariat is the reason for that and it represents an acute misrepresentation of what the UK housing problems are. If you can’t or won’t define the problem properly than any solution you give to solving the alleged problem will always fail – and please forgive me for stating the bloody obvious reader! A further problem in this errant London-centric analysis can be seen in the 37% increase in child homeless figure that was emblazoned across all national newspapers and headlined the TV news a day or so ago. There was an outcry and understandable outrage over this 37% figure yet imagine if the same national media had reported that outside London – which is 87% of the UK housing sector, – that the increase in children made homeless was in fact 52%! The real figure of the increase in children made homeless across seven-eighths of the UK was in fact 41% higher than the outrage the national media reported and the ubiquitous London, London, Bloody London focus helped the government in deflecting blame because the figure was chronically under-reported. Alas, the same always blame the private landlord as the easy and habitual target that the commentariat use deflects blame, attention and focus away from the inept government policies in this area as well as deflect attention from the real question of why there are so many social landlord evictions. In the rigid beliefs that (a) London must be worse off than any other area and in cahoots with (b) that evictions and homelessness is solely the fault of private landlords you miss sight of the fact that the data shows a 113% increase in social housing evictions ‘oop North’ from 2011 to 2016! Finally how strange that 6 months ago I can locate eviction data for the calendar year 2016 yet the usual suspects in the PPA commentariat release today some six months later piss poor analysis on data that is a year older than that? Staggeringly high social (sic) landlord evictions … shhh! Hi Joe. Since before the election was called, The Guardian has been sitting on a ton of nationwide first-hand accounts about the obscenely bad practices and excessive profiteering of many large housing associations, including my old friends Sanctuary Group. After Grenfell, The Guardian now has absolutely no excuse not to publish what they have. It’s time to begin a more honest national conversation about what is really going on with social housing. Great work, Joe.